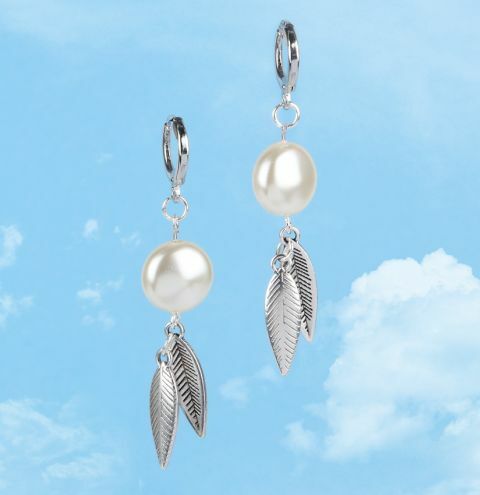 Make this beautiful pair of earrings using pretty antique silver feather charms and shining Swarovski coin pearls! Take one of your coin pearls and thread an eyepin through it. Trim and loop the other end of the pin, close to the pearl so the two sides of the bead each have a loop. Attach a feather charm to one of the loops. Make sure the loop is securely closed. To the loop on this feather charm, attach a jumpring and thread a second feather charm onto this ring before you close it. Make sure the jumpring is securely closed. Finally, attach a jumpring to the second loop on the other side of your coin pearl and attach one of your ear wires. Repeat these steps to create your second earring.